My attai (father’s sister) was the first one in the family to go ‘out’ and live in the ‘North’ after her wedding. Later she came back with a wealth of knowledge about the north Indian dishes as she was an eager learner of variety cooking. We had never heard of ginger-garlic paste or grinding of onion for the masala until aunty started preparing them for the family. She also loved to prepare a great many varieties of stuffed dishes. One among them is the stuffed eggplant. Mother too prepared this dish but at the most she would add only a small piece of cinnamon to the masala. She usually stuffed the vegetable with spice and then steamed it in pressure cooker before lightly sautéing it in a little oil. My brother’s wife microwaves the stuffed eggplant and then sautés it in little seasoning. I like my aunt’s method as it keeps the vegetable intact, yet juicy. 1. Peel onion and cut them into four pieces. 2. Chop tomato finely and keep aside. 3. Heat a drop of oil in a pan and add asafoetida, followed by the Bengal gram dal, coriander seeds, cinnamon and red chillies and roast till it is golden in colour. 4. Cool the roasted ingredients and dry grind them into a fine powder. 5. Now add the cut onions and salt to the powder and again run the mixer. 6. There is no need of adding water while grinding, since the juice of onion is enough to make a paste. 1. Wash and carefully slit eggplants from the top. Make eight segments (4 cuts), but leave the segments on the stalk, and don’t cut so far that the segment breaks away. Refer to the diagram for the cuts. 2. Stuff the vegetable in the middle and in between the segments with the ground paste. 3. After stuffing all the eggplants heat oil in a pan. 4. Add cumin seeds and the chopped tomatoes. 5. Add a pinch of salt and sauté for one minute. 6. Arrange the stuffed eggplants in the pan and turn each of them gently to coat with oil. 7. Cover with lid and cook on low fire until it is done. 8.When the vegetable becomes tender remove lid and keep sautéing till it absorbs all the spice. Enjoy with rice, chapattis or bread. Ama vadais and payasam are indispensable dishes in all festivals and feasts. Though there are varieties of vadai recipes, Ama vadai occupies the foremost position in a menu prepared for any festival. 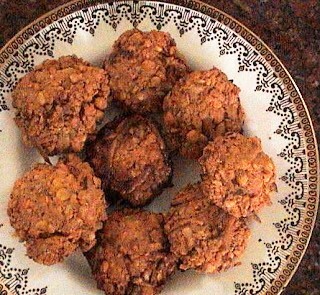 Ama vadai is prepared by frying a flattened ball of ground lentil and spice. Children and adults alike love to pop the vadais into their mouths, as and when they are fried. Many a time I have been left with no vadais to serve on the leaf at meal time. Old people love it when soaked in Rasam or Mor Kuzhambu. I have heard of a gigantic cousin of my grand father who used to consume a basketful of vadais at one sitting as he chatted with his friends. Just imagine the plight of the old aunt who had to grind the enormous quantities of the vadai dough in those ‘pre- electric mixer’ days! 1. Soak Bengal gram dal with red chillies for half an hour. 2. Grind ginger, asafoetida and the soaked chillies with little of the soaked dal. 3. Now add the remaining soaked and drained dal and salt to the mixer and grind into a coarse mixture. Do not add water, as the mixture should be thick. 4. Mix in the grated coconut and shredded curry leaves into the dough. The vadai mixture is now ready. 6. 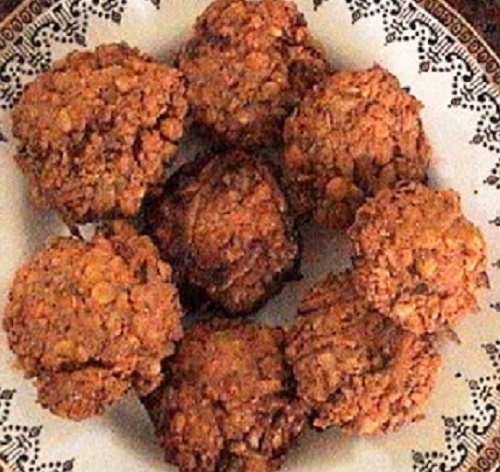 Take ¾ tablespoon of the vadai mixture and shape into a small ball using your hand. 7. Keep the ball on the palm of one hand, and lightly press and flatten with three fingers of your other hand, giving the vadai the shape of a turtle’s back. 8. Drop it in hot oil and immediately decrease flame. Frying on high flame will cook the outer parts faster, and leave the insides uncooked. 9. When the vadai looks cooked, increase heat and continue to fry till it is golden red in colour. 10. 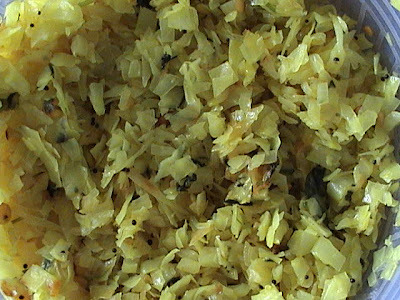 Vadais can be cooked in batches of six or eight. Enjoy them plain or savour it with mint or coconut chutney. 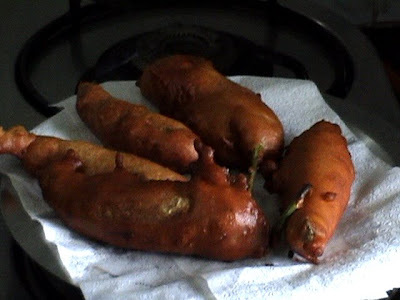 This is the traditional Ama vadai prepared for festivals or as prasadam /offering to Gods. Add chopped onion, grated carrot, mint leaves, garlic and cinnamon to the vadai dough to make Party Vadais. The monotonous groaning of the stone grinder was enough to announce that we were going to be served with either rice uppuma or pidi kozukattai for the evening tea. The aroma of the rice and lentil being ‘broken’ would never fail to kindle a craving, even as we hurriedly got ready to return to school after a full meal. As we went out to the back yard to wash our hands, we would see Lingamma sitting with one leg outstretched, and turning the iron handle of the stone grinder. 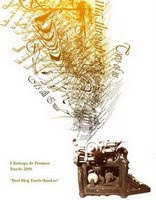 Her body - waist upwards- seemed to rotate along with the circular grinder as she went forward and backward, while feeding the ‘machine’ with rice and lentil with the other hand. This dance continued till she finished with all the rice which fell out from between the two circular stones, crushed or broken to the required texture. We always took a pinch of the flour and threw it into our mouths and rushed out, never waiting to listen to Lingamma’s whining for having moistened the flour. PIDI KOZUKATTAI is yet another steamed rice & lentil dish that is filling as well as easy on the digestive system. It is very good for children as it is double cooked. ‘Pidi’ means ‘hold’ or 'fistful' in Tamil. The dumplings are made taking a fistful of mixture in the palm of one hand and ‘holding’ or pressing it lightly with the fingers. 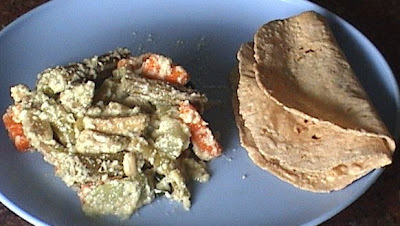 This dish was prepared often, especially when Machakottai or Avarekalu ( field beans) were in season. The addition of “kalu” or field beans to any recipe lends a distinct aroma to the dish which is adored by one and all. 1. Dry grind rice, mung dal and cumin seeds to the texture of semolina. 2. Wash the broken rice and dal mixture lightly, drain and set aside. 3. Heat oil in a pan and add asafoetida and mustard seeds. 4. When the mustard splutters add the broken red chillies and the curry leaves. 5. When the chillies become crisp, add 4 cups of water, and the salt, and bring to a boil. 6. When the water in the pan is boiling, add the rice and lentil mixture and stir continuously until it forms into a thick uniform mass. Now switch off the flame. 7. While the mixture is still warm, dip your hand in ice cold water and take a fistful (pidi) of the hot cooked mass and quickly press it into an oval ball or kozukattai. Note: You need to do this quickly, so that you do not burn your hands! If the mixture becomes cold, it is difficult to mould the mixture, and the kozukattais will break. 8. In the same manner, shape all the mass into several kozukattais. 9. Steam the kozukattais in a pressure cooker without weight, for 10 – 15 minutes. Serve hot kozukattais topped with a dollop of ghee, along with any gojju or chutney. My grandchildren love the kozukattais made with Basmati rice. To make masala kozukattais, the same procedure as above is followed, after substituting the rice and seasoning. Use a good flavourful basmati rice instead of normal rice. Omit the asafoetida, red chillies, mustard and curry leaves. Instead use chopped green chillies and ginger shreds for the seasoning. Cumin seeds instead of mustard seeds will create a different flavour. One cardamom, one clove and a very small piece of cinnamon can be powdered (or a pinch of garam masala) and added while seasoning. 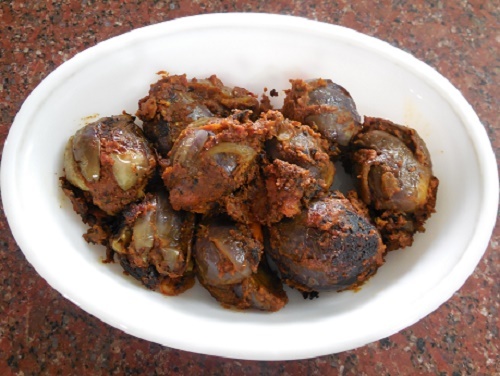 This kozukattai can be served with any North Indian masala sabji such as navaratna kurma, or paneer butter masala and so on, which are usually prepared with Palav or Rotis. It was the early sixties. Father took us on long drives almost every day, in spite of his multifarious activities. His blue coloured Companion van was perfect for our family. The four of us brothers and sisters fitted well in the long back seat, while father drove with mother by his side. My brothers monkeyed around by jumping back into the open boot and hopped back to the back seat as and when they liked. A picnic dinner at the grand Lalitha Mahal Palace (it was not a hotel at that point of time! 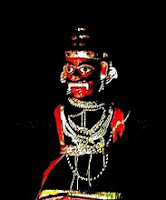 )which stood at the foot of Chamundi hills was a frequent agenda. Mother packed our favourite sambar rice and curd rice, with vadams (rice crispies) and pickles for the much awaited dinner. But the high light of the dinner was the special parcel and a crate of Fanta Orange which we picked up from the Sports Club on our way. There was a sprawling lawn and a grand fountain in front of the palace. On the opposite side huge flights of steps landed us in different levels of gardens. The domes on the lamp posts at frequent intervals shed cool dim light like the moon. We parked our Companion Van in front of the stairs and carried all our paraphernalia to one of the landing which again had a huge fountain in the center. Father took out the gramophone from the boot and turned the handle to play our favourite records. We loved to dance to “Chinkey Butterfly” which was a fast number, and “Over the Waves or Sobre Las Olas” which was a waltz. Father joined us in the fun while mother filled up our dinner plates. The lone watch man or the occasional wild wolves which came down the hill did not interrupt our merriment. The cool breeze and the privacy in the expanse of nature, under the star lit sky is most unforgettable. And then it was time to open the parcel ! All of us pounced on it to take a big helping of the Raja's Special and Peas on Toast. 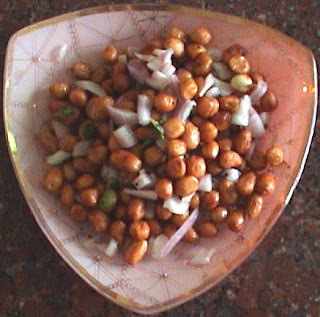 Raja's Special of yore is masala nuts of the present day. It seems this was the Raja’s favourite dish prepared at the Sports Club, and hence goes by the name Raja's Special. 2. When it splutters add finely chopped green chillies. 3. Add peanuts and roast till they crack, and allow to cool. 4. Add finely chopped onions, salt and the juice of lime. 5. Shake all ingredients in a vessel covered with a lid to blend well. 6. Top it with coriander leaves. Munch along as you watch your favourite movie, or as you watch this quaint version of Over the Waves or Sobre Las Olas! One of the quickest and easy dosas to make is the tasty, light and lacy Godumai dosai. Although not popular with my children, I would resort to making Godumai dosai when I ran out of ideas. Menu planning was never easy with three children with different tastes. It needed to appeal to their taste buds, and yet be nutritious. On the occasions when I made this dosai, I had to resort to cajoling, or using distracting techniques like telling stories, and sometimes even being very stern to make them eat. Sometimes, by the time the three kids ate, I would really feel enough is enough! I don’t recollect how, but I started the practice of making dosais shaped like flowers, stars and so on, after which they would readily eat up these dosais, with a little sugar or curd. I still remember the kids sitting in a row in the kitchen and demanding dosais shaped like a house, rabbit, bird, lion and so on! I would be a sport and try to fling the thin godumai dosai batter into these shapes. Children are anyway very imaginative. They would happily see these shapes, in the odd shaped dosais I made! 1) Make a batter of thin consistency by mixing all the ingredients. The consistency should be such that it is easily pour-able. Regular pancake or dosai batter consistency is too thick for this dosai. This should be watery enough, such that a ladle poured on the tava (pan) quickly spreads out on its own. 2) Heat a tava or pan. A non-stick pan is the easiest to use. Wipe a bit of oil or ghee on the pan, using a halved onion. This helps spread the oil evenly all over the pan. 3) Stir the batter so that it is well mixed. Take a ladle-full and splash it onto the tava in a circular motion. If the consistency is right, the batter will spread out on its own, or you can swish the nonstick pan to help spread it. 4) Air bubbles will rise and break giving a porous appearance to the dosai. 5) Turn down the flame to sim. You can add a little ghee around the dosai and inside a few of the pores. 6) There is no need to turn over the dosai to cook it. Leave it untouched, until the bottom becomes reddish brown and crisp, and the Godumai dosai easily slides off the pan onto a plate! You can serve this with a variety of chutneys. However I relish this with the adee rasam or the thick part of rasam! I got this Rockin Girl award from Lakshmi of Taste of Mysore. Check out the complete menu card here. These two awards are from Sireesha from Mom's Recipes. Sireesha's blog with a floral interface exudes the warmth and bonhomie of a busy happy mom. 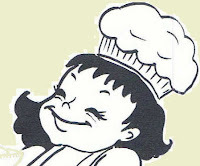 'Cooking is my passion' blinks a rolling pin on her home page. Neatly catalogued recipes, a juicy sweet lime to show the time, and You Tube videos of her lovely daugther... Sireesha has really made widgets make her blog come alive! Her independence day post is really worth a view! 'Feast your eyes' she says with an enticing slide show of delicious dishes! I am going to hoard these awards for a while, before passing them on! The Simple Ubiquitous Vengaya Rava Upma or Flavoured Semolina with Onion? 'Upma' stems from 'uppu' or salt and 'maav' meaning flour. In most South Indian languages upma stems from 'salt & flour' -- 'Uppu-maavu', 'Uppu-Pindi', 'Uppu-hittu'. One of the easiest and quick breakfasts to make, rava or semolina upma is very healthy and rich in iron content. Homes and restaurants are ever ready to serve this simple delicious dish at any time of the day. There are hoards of variations to this simple recipe by changing the vegetables and spices – add tomatoes, carrots and peas; use Bisibele masala, or Sambar powder; emphasize any spice; include some grated coconut …the possibilities are endless. Upma traditionally made with semolina, is now being made with a number of other cereals. It’s quite common these days to see upma made with broken wheat, rice flakes, oats, and even bread. 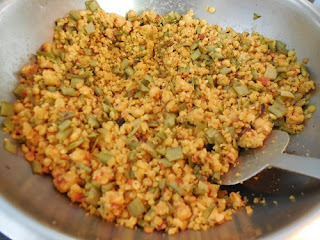 My children overseas use Cous Cous, Polenta, Quinoa and a variety of Pastas as well to make upma. With some imagination you can come out with many more. A copious amount of good quality ghee added to upma is key to making it really tasty, although not a healthy option. Given below is a very simple and basic upma recipe, without ghee. 1. Chop onion, ginger and green chilly finely and keep aside. 2. Set 3 cups of water along with salt to boil on one flame. 3. Meanwhile heat oil in a wok and add mustard seeds. 4. When it splutters add black gram dal and Bengal gram dal and roast till they are golden in colour. 5. Add green chilly, ginger and curry leaves and sauté. 6. Add chopped onion and sauté till it is pink in colour. 7. Add the turmeric powder and the semolina and roast till it gives out a pleasant aroma. 8. Now pour the boiling water into the rava mixture, stirring continuously, and blend well. Note: If you do not stir, you will end up with a lumpy texture, and sometimes the rava inside the lumps will not even be cooked. 9. Cook on low flame until all the water is absorbed and the upma starts leaving the sides of the wok. 10. 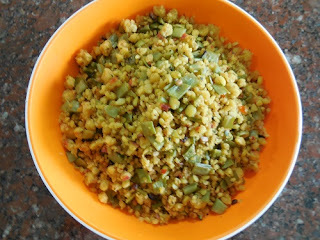 Squeeze out the lime juice into the upma, while it is still hot and pliable and blend well. 11. Switch off the flame and leave it covered for a few minutes. If you don’t mind adding ghee, then you can add it in Step 2, and boil along with the water, or add it in step 8 while stirring the upma. Decorate with coriander leaves and enjoy with chutney or a cup of curd. At the mention of the very name, I remember the varied contortions that used to distort my husband’s face! He detested having to eat the ‘off white over cooked vegetable’, which also ‘smelt awful’. Hence cabbage curry was taboo at home, especially when we had guests at home. Somehow, the chances of spoiling a cabbage curry are more when compared to cooking other vegetables. Either it is over cooked or is half done! My grandmother was an excellent cook who had strict rules about the dos and donts for good cooking. She cut the vegetable so finely that it cooked in a minute when she immersed it in boiling water. She would immediately drain and season it. The addition of fresh grated coconut made it more lovable. My grandchildren love this simple curry when prepared to their taste. Adding boiled green peas makes it all the better. Though it is not his favourite curry, my husband holds no grudge against it any more. 1. Clean and chop cabbage as finely and as uniformly as possible. 4. Add broken chillies and curry leaves. 5. Add turmeric powder and fry. 6. Add the cut cabbage and stir once to blend with the seasoning. 7. Add salt and a dash of sugar and again blend well. 8. Cover the pan without letting any steam to escape, and let the curry cook over low flame. 9. Remove lid now and then to ensure its not over cooked or browning. 10. When the vegetable is half done and when it throws out water remove lid and increase the heat. 11. Let it cook in its own water until all the water is absorbed, and remove from fire. 12. Optional: Garnish with fresh grated coconut . Rasam is a flavourful watery soup served with rice as a second course in a South Indian meal, the first being the Sambar and rice. Once rasam is made, the heavier dals and spices settle down at the bottom of the vessel, leaving the nutrient rich and flavourful watery liquid at the top. This liquid is light, and excellent for digestion. Both the light liquid, a well as the rich dal residue can be taken with rice based on preferences. In South Indian weddings more and more people are opting for at least one buffet meal, instead of the traditional meal served on banana leaves. For a long time rasam was not served in buffets as it was impossible to handle the watery dish in a hand-held dinner plate filled with various other dishes. Gauging people’s taste and demand the caterers have now a days started to include rasam-rice in their menu. The unanimous choice of mothers whose babies have just been introduced to solids is the one and only rasam rice. A few spoons of softly cooked rice and dal mashed well with rasam and a drop of ghee is relished by most babies. My siblings and I have grown up solely on rasam rice almost up to the age of ten. My three children were especially fond of Poondu Rasam or Garlic Rasam. The cloves of garlic in the rasam will settle down at the bottom of the vessel. The scene of my three children, each with a ladle in hand, competing as to who should ‘pearl-dive’ first to get the ‘pearls’ or the garlic cloves from the bottom of the rasam vessel is still fresh in my memory. Pressure cook tur dal with turmeric powder in 3 cups of water. 1. Dry roast pepper and cumin seeds and keep aside. 2. In a drop of oil, roast asafoetida, coriander seeds, bengal gram dal, fenugreek seeds and red chillies until they become crisp and golden in colour. 3. Powder all the roasted ingredients and keep aside. This is freshly prepared spicy rasam powder. While more quantities can be made and stored in air tight containers, rasam tastes best with freshly ground spices. 1. Pressure cook tur dal with turmeric powder in 3 cups of water, and keep aside. 2. Extract the juice out of the tamarind and add water to make ½ a pint and add salt. 3. Peel the skin of the garlic cloves. Add to the tamarind water, and boil until they are cooked. 4. Add cooked dal , chopped tomatoes, and curry leaves. 5. Add little water to the spicy rasam powder and make a paste, and then add it to the rasam. 6. Stir and blend well until it starts to boil. 7. Add ½ more pint of water and decrease heat. 8. Add coriander leaves and allow the rasam to gather lots of bubbles on the top. 9. Note: Remove rasam from flame just before it starts to boil, as boiling mars the flavour. 10. Heat ghee and add mustard seeds and pour it on to the rasam after it splutters. Enjoy the watery top portion of the rasam in a glass as an appetizer or relish the thick spicy dal and garlic residue with steaming hot rice topped with a spoon of ghee. Usili is a dry preparation with dal and vegetables. Dal in the form of usili, is a pleasant change from the usual liquid and mushy forms such as sambar. 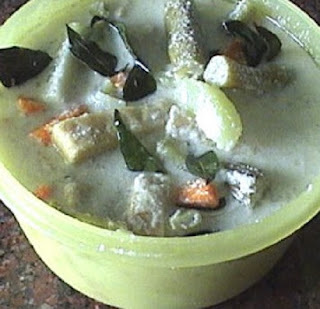 Paruppu Usili is served as one of the curries in feasts. One of our friends, who happens to be a media celebrity, loves this dish very much. As his career demands him to be trim and slim, he is very careful about his meals. Since he has taken a liking to this dish, he relishes a bowlful of the Usili and washes it down with a glass of buttermilk. That is it, and he is done with his lunch! 1. Soak both the Red Gram and Bengal Gram dals along with the dry red chillies for ½ an hour. 2. Cut cluster beans finely, and cook with enough water and a pinch of salt and keep it aside. 3. Drain the soaked dals and chillies thoroughly, and grind along with asafoetida and salt, into a coarse mixture. Take care not to over-grind into a paste. 4. Heat oil in a wok and add mustard seeds. 5.When mustard splutters add black gram dal and roast till it is golden in colour. 6. Next add turmeric powder, curry leaves, followed by the cooked cluster beans. 7. Sauté till water evaporates, and the beans are dry, then add the ground dal mixture and mix thoroughly. 8. Spread the whole mass evenly inside the wok and cover with a lid. 9. Cook over low fire for about 3 minutes, until the dal is cooked. 10. Now remove lid and turn the vegetable and dal mix and again spread it evenly inside the wok and continue to cook in low fire, this time without the lid. 11. Keep turning and spreading out the dal and vegetable mixture until finally the whole mass breaks up and crumbles into a sandy textured mixture, giving out a pleasant aroma. 12. Paruppu usili is now ready. If you like a slightly crunchy texture, you can add a little more oil and roast as long as you wish till it becomes sandy and gives out a pleasant aroma! A mixed vegetable Paruppu Usili can be prepared by sautéing minced onions, capsicum, carrot, peas and cabbage before adding the ground dal. Vendhaya Keerai (Fenugreek leaf ) Paruppu Usili is a very healthy and popular dish. Follow step 1 and 2. 3. steam the coarsely ground dal for fifteen minutes. Next follow step 4, 5 and 6. 7. Crumble the steamed dal and add it to the vegetable seasoning. 8.Keep stirring till the Usli becomes dry and crumbly. 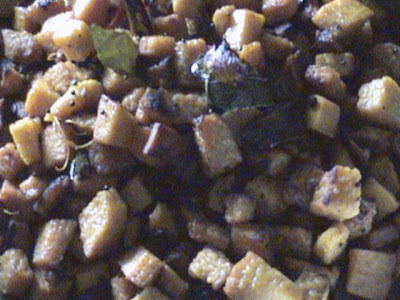 Paruppu Usili as a side dish makes a great combination, with the main course of More Kozhambu or Koottu and hot rice. Pachidi is prepared with raw vegetables and curd, and acts as cooling side dish, when served along with spicy food. Sometimes vegetables like pumpkin or potatoes are boiled before making the pachidi. Fried ladies finger (Okra) pachadi is a delicacy too. Cucumber Pachidi is the most commonly prepared pachadi and very easy to prepare. Once when I added some grated carrot to the Cucumber Pachidi my little granddaughter exclaimed “National Pachidi”. She was just learning about everything national – national bird, national animal, national flower –at her play school. I was amazed at her sharpness when she identified the colours of the National Flag in this dish. I wish to dedicate this recipe to my cute little granddaughter who has also christened the dish as NATIONAL PACHIDI. Method:1. Grate cucumber along with the green skin, add salt and leave it aside. 2. Scrape and grate the carrot in another bowl. 3. Squeeze out the grated cucumber and add it to the carrot. 4. Add curd and blend well. 5. Season the Pachadi by spluttering mustard seeds in hot oil. 6. Decorate with coriander leaves.I did not have the heart to spoil the 'National' effect by adding the seasoning for the photo. Refrigerate and serve if you want it really cool. Curry or Porial is a vegetable prepared as a side dish. Its does not contain any gravy. A great many varieties of curries can be cooked with any vegetable under the sky! Two or four varieties of curries, are usually prepared in great luncheons. Varieties include the mildly seasoned sauteed or boiled vegetables. Fresh grated coconut may or may not be added. The second is the roasted or fried variety. Senai Kizhangu curry is a mix of both, and is first boiled and then roasted. 1. Rub your palms with oil (beware, if you don’t do this, yam causes itching!) and cut the yam into small pieces, discarding the rough skin. 2. 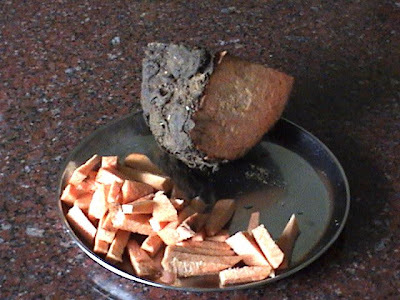 Boil the yam in adequate water with tamarind, turmeric powder and asafoetida. 3. When the yam is cooked add salt and boil it for a few more minutes and drain the water. 4. Heat oil in a pan and add the mustard seeds. 5. After it splutters add the black gram dal until it turn golden. 6. Add broken red chillies and fry till crisp. 7. Add curry leaves and then the cooked and drained vegetable. 8. Saute it with a spatula until it becomes dry. 9. If you want the curry to be crisp add 2 more spoons of oil. Cook this on low flame till it becomes crisp, mixing occasionally. Enjoy as a side dish with the main course. Avial is a mixture of selected boiled vegetables cooked in coconut-curd base. A curry-like thick Avial (Variation 1) can be relished as a side dish with the main course. The gravy-like Avial (Variation 2), can be mixed with rice. 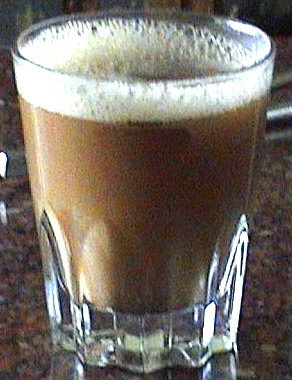 This type of Avial is served with Aapams and Adais (both are variations of pancakes) in many restaurants. Avial lends a special festive touch to even a simple meal. Poosnikai (Ash gourd), Murungakai (Drumstick) and Chena Kizhangu (Elephant yam) are the key vegetables in the preparation of Avial. In addition to this, you can also use one or more of these vegetables as well - brinjal, marrow, french beans, carrots, raw banana, potatoes, field beans, cucumber, and broad beans. Care has to be taken while cutting the yam to prevent itching and irritation. A thin coating of oil on the hand, or rubbing the hands with tamarind juice will help. A friend who tried in earnest to help out in the kitchen, created a ruckus when she saw what she thought was her skin peeling off after cutting marrows. It’s just the juice of marrow that had dries into a thin film on hands, which can be virtually peeled off! Beet roots and Raw Bananas will leave a black stain on the finger tips after cutting. Guarding your hands before chopping vegetables prevents a lot of unpleasantness after good cooking. Happy cooking without stains and pains! Vegetables:Cut the following vegetables into two inch long strips. 1. Grind grated coconut and green chillies into a smooth and thick paste. 2. Boil the chopped vegetables with just enough water and salt, to ensure that the shape of vegetables is retained, and water is evaporated. Avoid overcooking the vegetables into a mash! 3. Heat coconut oil in a pan and add the curry leaves. 4. Add the ground coconut paste and toss for a minute. 5. Add the cooked vegetables and salt and toss till you get a pleasant aroma. 6. Remove from flame and mix in the curd. Enjoy this a side dish or a curry. The ingredients for this avial are the same as above. The only additional ingredients, in this Avial are 1tsp of rice flour, and additional cups of water. 1. Boil all vegetables, with salt as given in the recipe above, using more water. 2. Grind grated coconut and green chillies with a tea spoon of rice flour. 3. Mix the ground paste with curd, and an additional cup of water. 4. 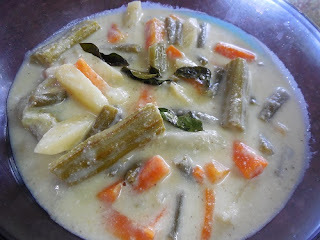 Remove the boiling vegetables from the flame, and mix in the coconut-curd paste. 5. Add salt to taste, if required. 6. Set this on a low flame again. Simmer up to boiling point, and immediately remove from flame. Note: Over boiling causes the curd to break. 7. Heat the coconut oil, fry the curry leaves, and season the Avial. Enjoy with aapam, adai , steaming hot rice or puligare. The medicinal value of black pepper is well known. Milagu kozambu or Black Pepper Gravy is a welcome change after one has been subjected to rich food continuously. It is very good for digestion, and has an appealing taste as well. Taste buds tend to hibernate, leaving a bad taste in the mouth as a result of over eating or indigestion. Milagu kozambu activates the taste buds and induces hunger. It alleviates biliousness, mouth watering and bitterness in the tongue. My sister shuns Milagu kozambu during dinner. She is terrified by the affliction of hunger pangs which would wake her up in the middle of the night. If you take a liking to the colour, taste and flavour of milagu kuzambu, you could savour it with hot rice and ghee, just like any other kozambu. A mixed vegetable salad, roasted papad, or a pachhadi (yoghurt dip) can make a delicious combination. Hot milagu kozambu and rice, is often served after Yennae kuliyal or a traditional oil bath. An 'oil-bath' begins with a full body and head massage with warm sesame oil, and a bit of castor oil for the eyes, nose and navel. This is then followed by a rub down with freshly ground turmeric - natures best medicine for the skin. The oil is then washed away with Shikakai powder and other natural fragnant cleansers, and lots and lots of very hot water, as hot as you can you can take! 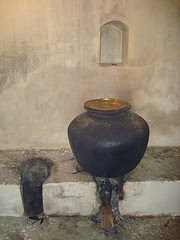 (The picture alongside shows water getting boiled for a yennae kuliyal in our village! ) A meal that includes a course of hot milagu kozambu rice, after an oil bath leaves one feeling light and detoxed, and is truly a heavenly experience. 1. Heat ½ tsp of oil. Add asafoetida and pepper and roast. 2. Next add cumin seeds, coriander seeds, tur dal, and red chilly and roast till the pepper cracks and the dal becomes golden in colour. 3. Add curry leaves and roast till it splutters. 4. Add the tamarind and remove from flame. 5. Allow the ingredients to cool, and then grind them finely. Add a 1 cup of water and salt and grind into a paste and set aside. 6. Heat oil in the now empty pan and add the mustard seeds and allow it to splutter. 7. Add urad dal and roast it till golden in colour. 8. Now add the ground paste with 1 more cup of water and salt. 9. Boil till the kozambu thickens and the aroma triggers off your digestive juices. 10. Remove from flame and serve with piping hot rice and a dollop of ghee.